Everyone loves to see their name in lights and your sporting facility may be just the place for them to do that. Advertisers and sponsors deserve a special spot of prominence at your facility and Toadvine Enterprises can help you honor those important people and businesses. You can give dedicated sponsors and important donors that guaranteed exposure by offering them their choice of advertising opportunities around your school sporting facility. Ad space is available on signs, stadium seating, score boards, and numerous spots throughout your school and will help generate opportunities for schools to offset the cost of new equipment and installation. Not only will the aesthetic appeal of the banners and signs generate visual appeal, they will also generate revenue for schools looking to boost their athletic dollars. Most of the time, the space used for the advertisement is space that would go unused without the dedicated sponsorship. Here are the top 10 places within a school sports facility that a school can utilize visually appealing advertising to generate funds for their athletic department. Colosseum Chairs – Instead of a number on the seat, place the donor name on the seat for special recognition. VIP Seating – Select a special section to be recognized for special donors or groups and increase their game day comfort with unique additions like arm rests and special seat backs. Banner Rail – Utilize unused space on your colosseum with the touch of a remote and roll up or down the special message of your sponsor. AdMesh Banners – Vinyl coated, weather resistant banners are perfect for capturing the attention of outdoor sports fans. Concourse Banners – Capture the attention of pedestrians with concourse banners as they walk around the perimeter of your facility. 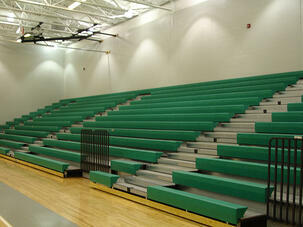 Grandstand Banners – Take advantage of any unused space with banners that honor and promote your advertisers. Vertical Banners – As patrons walk to and from the concession stand and the restrooms, these vertical banners will catch their attention. Field Level Ads – As the most visible position on a field, utilize the sidelines, fences and walls at eye level to become the focal point of your grandstand, field or arena. Loge Boxes – Give advertisers a special place to pamper guests in a place specially designated and enhanced for their game viewing pleasure. Aisle and Stair Risers – Every person attending a game must ascend a set of stairs to get to their seat, capitalize on this fact by placing your sponsors name in bold colors for everyone to see. Think you can't afford stadium seating? Consider the amount of advertising dollars you could generate from donors and sponsors that will actually see their name in lights at every game they attend. Most of these themes can be incorporated into existing facilities, but if you would like to explore the opportunity of generating more advertising dollars in conjunction with installing stadium seating, contact us for more ideas on how we can assist you. Turn off the power to the scoreboard and controller after use. Store controllers and radio equipment in a dry place, especially in off-season. Protect controllers and radio equipment from becoming wet while in use. Take care to protect cables and power adapters from becoming tangled and out of the way of traffic at the scorer’s stand. Always turn off the power or disconnect power cords to any electrical device before servicing. Aside from these scoreboard maintenance and safety tips, a lot of schools are also starting to take advantage of the advertising space provided on most scoreboards, maximizing the available real estate. There are a whole host of new and traditional scoreboards from Nevco that create prized advertising space. These advertising spaces can pay for the new equipment and create an increased professional feel to your facility. 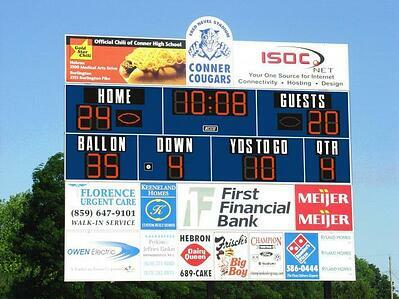 Check out the gallery of scoreboards from Nevco. Contact Toadvine Enterprises for more information about maintenance or safety issues, as well as questions about your scoreboard's ad space.